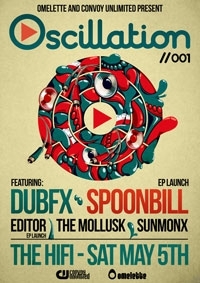 SPOONBILL & EDITOR EP LAUNCH, with DUB FX, THE MOLLUSK & SUNMONX: Sat 5th MAY, HIFI MELB. Sat 5th May 2012 @ The HiFi Melbourne. After a non-stop floor slamming European and Canadian tour "Dubfx and Flower Fairy" are ready to team up with Spoonbill for a massive night at the HIFI Melbourne. Saturday May 5th marks Dubfx’s debut Australian club performance capping off a summer of massive festival slots in Australia and New Zealand including. Co-headliner Spoonbill will be launching a new funked-up party fuelled EP: Astro Archipelago that’s ready to shake the town and elevate the dance floor to new heights. The spoonbill show will feature a flock of live muso’s and synchronised visuals. Melbourne fatbass and wonky outfit Editor will also be launching their new EP: Itchy Techtonics featuring solid tasty digs for bass connoisseurs. Also featured on the bill are the glitchy funky party tunes of The Mollusk, and the solid deep and dirty grooves of SunMonx that will surely rock socks and get the floor bumpin. Witness world class beat-boxing, psychedelic glitch-funk, liquid DnB, Wonky Dubstep and ground breaking sub frequencies that will shake your boots off! All this noise will be augmented with brilliant visual jockery to keep the senses stimulated. Witness this!